A ground-breaking and brave inside reckoning with the nexus of prison and profit in America: in one Louisiana prison and over the course of our country's history. In 2014, Shane Bauer was hired for $9 an hour to work as an entry-level prison guard at a private prison in Winnfield, Louisiana. An award-winning investigative journalist, he used his real name; there was no meaningful background check. Four months later, his employment came to an abrupt end. But he had seen enough, and in short order he wrote an exposé about his experiences that won a National Magazine Award and became the most-read feature in the history of the magazine Mother Jones. Still, there was much more that he needed to say. 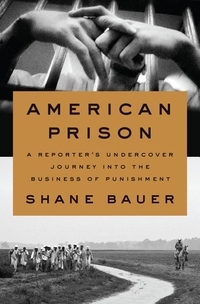 In American Prison, Bauer weaves a much deeper reckoning with his experiences together with a thoroughly researched history of for-profit prisons in America from their origins in the decades before the Civil War. For, as he soon realized, we can't understand the cruelty of our current system and its place in the larger story of mass incarceration without understanding where it came from. Private prisons became entrenched in the South as part of a systemic effort to keep the African-American labor force in place in the aftermath of slavery, and the echoes of these shameful origins are with us still. The private prison system is deliberately unaccountable to public scrutiny. Private prisons are not incentivized to tend to the health of their inmates, or to feed them well, or to attract and retain a highly-trained prison staff. Though Bauer befriends some of his colleagues and sympathizes with their plight, the chronic dysfunction of their lives only adds to the prison's sense of chaos. To his horror, Bauer finds himself becoming crueler and more aggressive the longer he works in the prison, and he is far from alone. A blistering indictment of the private prison system, and the powerful forces that drive it, American Prison is a necessary human document about the true face of justice in America.